This powerful amplifier with ARC room correction will fix your room's acoustic problems while streaming hi-res music. Second, while Play-Fi is no less proprietary than Sonos, DTS licenses the technology to other manufacturers, providing a broad range of products that you can not only mix and match, but also control from the same app.Case in point: While Sonos still doesn’t offer outdoor components, Polk has offered an outdoor speaker (the Polk Omni S2) for years, and Soundcast’s upcoming VGX series of outdoor speakers will also be Play-Fi compatible. Paradigm’s sister brands Anthem and MartinLogan have also joined the DTS Play-Fi party. I wrote extensively about DTS Play-Fi in my review of the Polk’s Omni S6, and my disappointment with the DTS Play-Fi app and its user interface hasn’t abated. But, perhaps I’m just more tolerant of it now after nearly six months using DTS Play-Fi across a variety of products (including Anthem’s superb AVM 60 preamp processor). 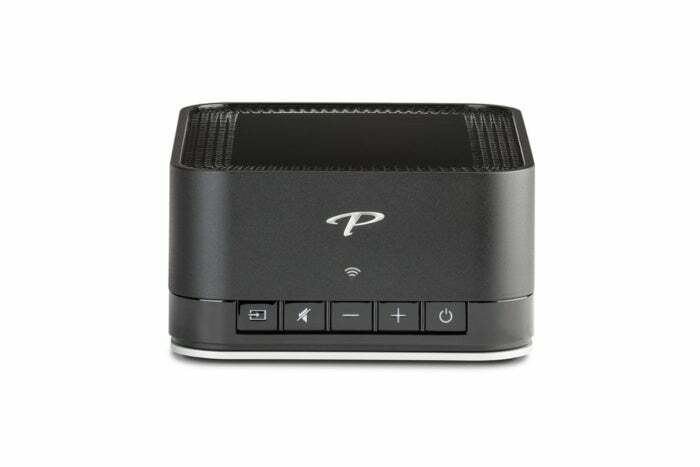 Paradigm’s PW Amp is part of a larger family of Premium Wireless products that include wireless speaker models and a preamp bridge that will turn any home receiver into a DTS Play-Fi hub. Nevertheless, some of DTS Play-Fi’s highlights worth mentioning include streaming of all major hi-res music lossless codecs including FLAC, ALAC, WAV, and DSD. Unfortunately, at the time of this writing, DTS Play-Fi does not support MQA-encoded files natively. DTS Play-Fi does support today’s popular streaming-music services, including Amazon Music, Deezer, iHeartRadio, Pandora, Spotify, Tidal, and more. 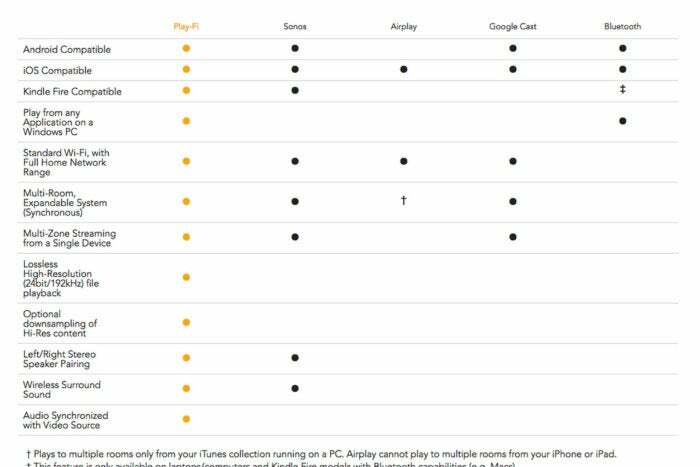 You can use an iOS device with Play-Fi spaekers, but you can’t stream music from that company’s Apple Music service. 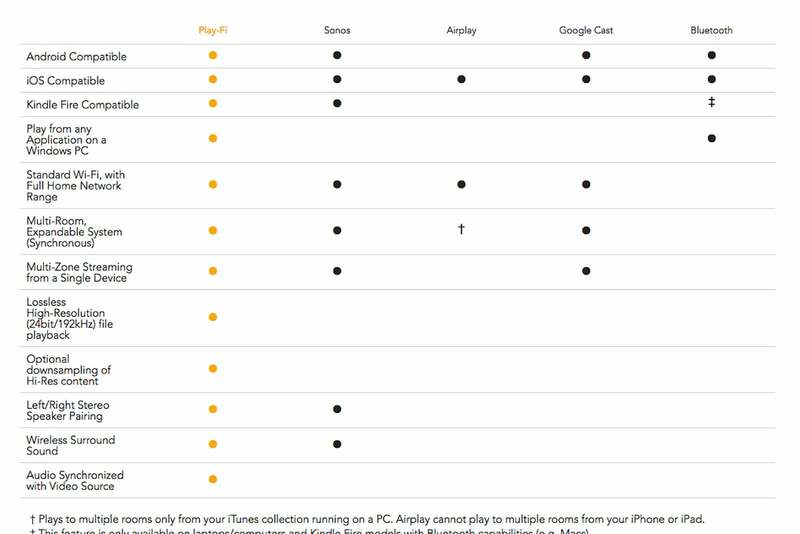 Summary of select DTS Play-Fi features compared to some competing solutions. You can’t play Apple Music files offline, either, and native iTunes support on a Mac is also lacking. There is a simple and straightforward work around: Support your iTunes library by leveraging DLNA. Install a product such as FireStream UPnP/DLNA media server, and you can expose your music folder on your network as a DLNA/UnP share. I used FireStream with my MacMini iTunes server with relatively few issues. My only complaint is that DTS Play-Fi took several seconds to scan my network for a DLNA server each time I launched the app. I would have preferred that the app remembered my DLNA server’s IP address, brought it up, and then scanned my network for additional devices. 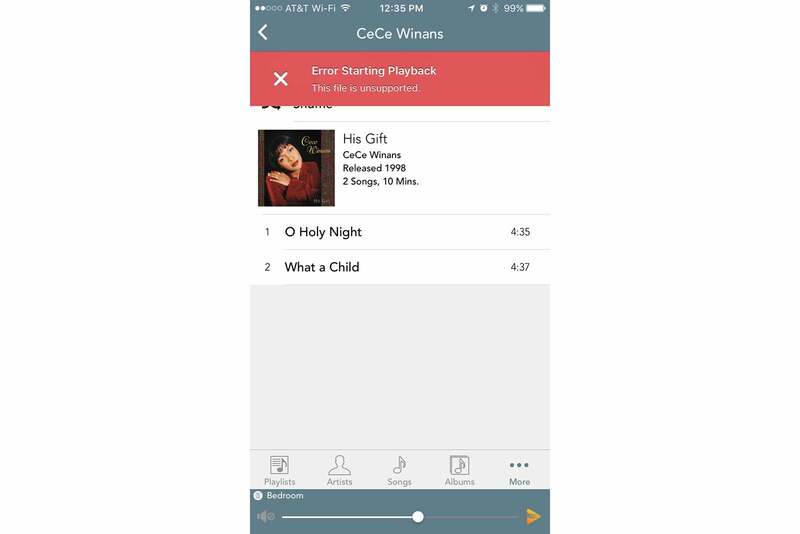 Small but noticeable gotchas like that continue to prevent the DTS Play-Fi app from being a totally seamless and fluid experience. 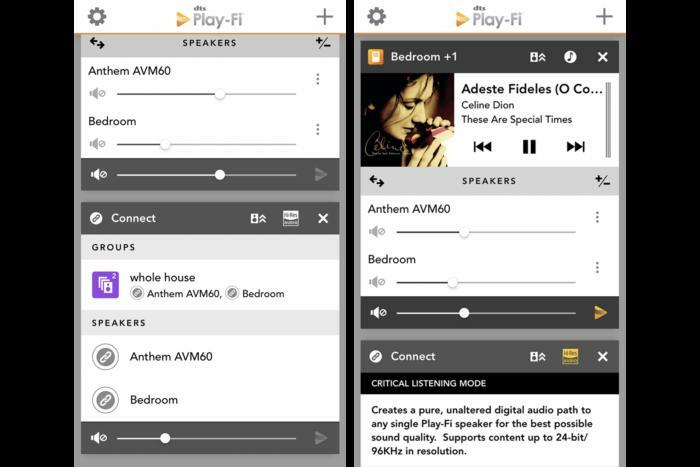 You can group multiple speakers and create multiple zones with products from different manufacturers with DTS Play-Fi. I was able to group the Anthem AVM 60 pre-pro and Paradigm PW Amp into a zone. As with a Sonos system, you can group multiple DTS Play-Fi speakers together to form stereo pairs or even 5.1-channel audio setups for a home theater setup. Purchase the DTS Play-Fi HD driver, $14.95, and DTS Play-Fi will also support audio-video synchronization with video streamed from Netflix, YouTube, Hulu, Amazon Video, and other services—when streamed to a Windows PC with a DTS Play-Fi speaker connected. The macOS is not supported in this way. DTS says Play-Fi is the only multi-room streaming platform that can perform this lip-sync with a video source. DTS Play-Fi doesn’t support Apple Music and wouldn’t play any files I had downloaded to my iOS device from Apple’s Music Service. The Paradigm PW Amp can be used with a pair of bookshelf or tower speakers and run as a conventional two-channel audio system, but it can also operate as a zone amplifier to power architectural (in-wall or in-ceiling) speakers installed in your home. The PW Amp has variable volume control both on the unit’s front and via the DTS Play-Fi amp, so it’s not practical to use as an amplifier in a traditional home theater setup. The PW Amp has a dual-band 2.4-/5GHz Wi-Fi adapter onboard, but the heart of the device is a Class D stereo amplifier manufactured by Paradigm stablemate Anthem. It’s rated to deliver 50 watts per channel with 8-ohm speakers, and 100 watts per channel into 4-ohm speakers. Paradigm says the amp can deliver peaks of up to 200 watts per channel into 4-ohm speaker loads if your music or speakers demand it. 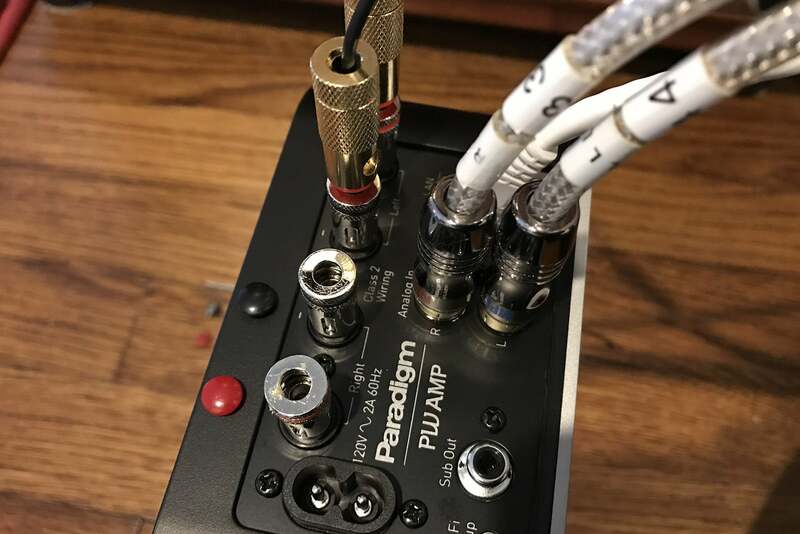 On the rear of Paradigm’s PW Amp you’ll find push-button binding posts (they can also accommodate banana plugs), analog RCA inputs, ethernet, a USB port, and a subwoofer output. The PW Amp’s front face has an input toggle, mute, volume control, and power buttons. The PW Amp will go into standby power mode after 20 minutes of inactivity. By default, the amp’s input is set to accept DTS Play-Fi streams. Press the input once and it will turn from white to blue to indicate it’s now accepting analog audio. Press and hold the input button for five seconds and it will switch into auto mode and play whichever of the two sources is active. The rear of the PW Amp has stereo RCA inputs, an ethernet port, an RCA subwoofer output, and a pair of push-button binding posts. You could argue that Paradigm should also have included a Toslink digital input, HDMI, or an additional ethernet port so that you could use it as a switch. Denon’s Heos and Sonos’ amps include some of these features. But, truth be told I didn’t miss any of them in real-world use. If you’re disappointed in the selection of push-button binding posts that can only accommodate bare speaker wire, don’t be. If you want to use banana plugs, all you need to do is pry off the red and black plastic plugs with a flat-blade screwdriver. Still, I much prefer the higher-quality five-way binding posts Anthem uses on its power amplifiers. You can pop off the PW Amp’s colored binding post caps to accommodate high quality banana plugs for your speaker cabling. The shape of your room, the height of the ceiling, the material covering the floor, the thickness and texture of the walls, the presence or absence of windows (and window coverings), and other architectural factors will have a significant impact on your audio system’s performance—no matter how great your speakers, amplifier, and other components might be. It’s why the speakers you buy don’t sound the same at home as they did in the showroom. “Playing the room” describes the time-consuming process of placing, listening, repositioning, and repeating those steps ad nauseum until you’re satisfied with your audio system’s sound. A few people enjoy this process, but most of us don’t. 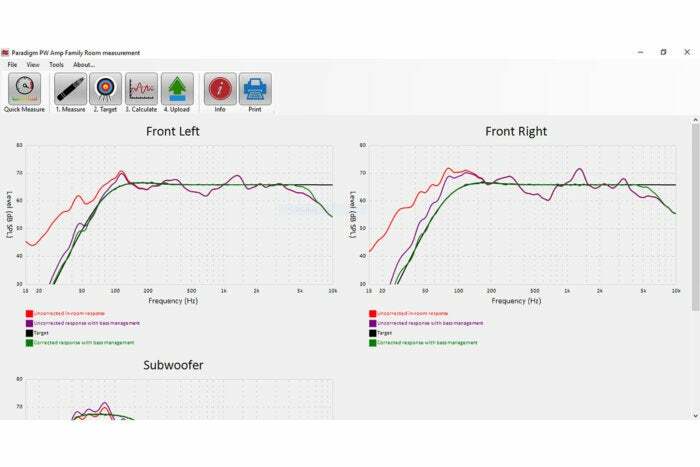 Fortunately, technology offers an easier way: Calibration tools like Anthem Room Correction (ARC—but don’t confuse it with HDMI’s Audio Return Channel) can analyze a room’s layout and automatically change amplifier settings to compensate for the room’s shortcomings. Such tools aren’t a substitute for poor speaker placement, but they can help address many of the adverse effects of speaker-room interaction. That’s why they’re called “room correction” solutions. The presence of ARC in Paradigm’s PW Amp is a game changer in multi-room audio systems—it raises this product head and shoulders above the competition. None of the competing solutions from Blue Sound, Denon (Heos), Yamaha (MusicCast), or several others—integrate a room-correction tool in their streaming solutions. Sonos has a rudimentary system that relies on the microphone built into iOS devices, but it's results are not nearly as dramatic as what ARC can do. Many of today’s mid-range and higher A/V receivers come with some kind of room correction, too, but few compare to ARC—and I don’t know of any reasonably priced model that will allow you to apply room correction to any zone other than the main listening room. And if that’s not enough, you can run ARC’s calculations via Wi-Fi. Unlike most other room-correction systems, you aren’t limited by a 20-foot cable that has to plug back into your A/V receiver. You can run ARC across your house and even from a different floor. I was able to EQ my family room speakers a good 60 feet away from where I installed the Paradigm PW Amp. In a nutshell, what makes Anthem’s ARC so effective is what it does as well as what it doesn’t do. ARC will only correct audio frequencies up to 5kHz. It’s in deep bass notes and frequencies up to 5kHz where room correction can have its greatest effect. Correcting above 5kHz can sometimes have unpredictable—and even unpleasant—results. Most importantly, ARC takes your room’s bass reinforcement into account, and it does a phenomenal job of applying just the right amount of bass EQ without sucking the life out of it. Using ARC room correction is simple and straightforward. Using ARC is simple and straightforward: Paradigm includes a calibrated USB microphone with the PW Amp. Simply plug the microphone into a network-connected Windows PC and follow the on-screen instructions. ARC’s software communicates with the Paradigm PW Amp automatically. You’ll then hold the calibrated microphone an arms’ length away from your body at five points along an X-shaped path. A few test tones will play through your speakers and that’s it, you’re done. ARC does all the rest. Running the Windows version of ARC will show you your speaker’s averaged frequency response, what the optimal response should be, and how your speaker will measure after ARC applies its correction. You can even print out a colored graph and report to show off to your friends. ARC won’t work on a Mac. If you’re on a Mac you’ll need to install Windows on a Bootcamp partition. Paradigm and Anthem do not recommend using Parallels or VMWare Fusion. If that doesn’t work for you, then you can use an iPod or an iOS smartphone or tablet. ARC now comes as a mobile app and uses your iOS device’s built-in microphone to conduct all its calculations. If you opt to use the mobile app, you don’t get the before and after graphs and you can’t print out a report. For more info you can read my in-depth preview of the ARC mobile app here. 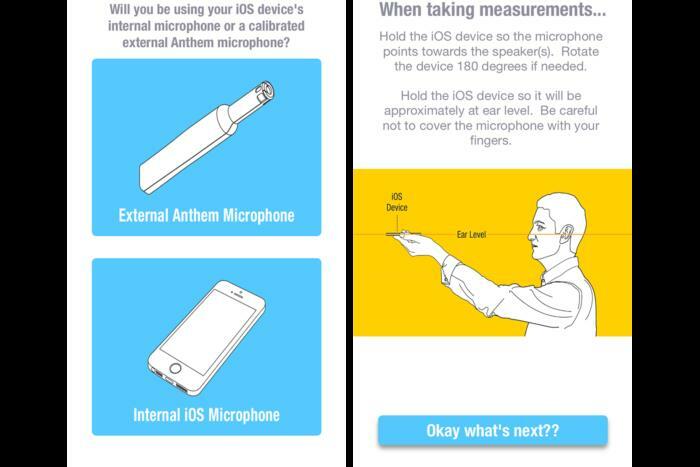 Coming in early 2017, Paradigm will be offering a calibrated, stand-alone microphone for iOS devices that will all but eliminate the need to use a PC altogether. You can see the measurements of the left and right speakers in my family room with significant dips and peaks caused by their interaction with my room. When ARC applies its filters the finished, corrected speaker response (green) is almost identical to the flat target (black) in-room response. If you own an Anthem MRX receiver or AVM 60 pre-pro and really want to geek out and get the most accurate ARC calculations possible, you can use the calibrated and serialized microphone that came with those units. The serialized microphone that comes with the MRX receivers and AVM 60 pre-pro comes with a special calibration file that compensates for variations with each and every microphone. Therefore, it’s more accurate and has tighter tolerances than the mic included with the Paradigm PW Amp. Once you’re done with your ARC measurements, the ARC mobile app or PC software app will automatically upload those results to the Paradigm PW Amp. From then on, ARC’s correction is active anytime you play music. If you want to temporarily turn off ARC and see how much of a difference it makes, simply press the mute button on the front of the PW Amp for five seconds. To re-enable ARC, press the mute button again for five seconds. You’ll love using this A-B feature to impress your friends and to justify to your spouse why you needed this amp so badly. I tested the PW Amp in three different speaker setups featuring higher-end architectural speakers. The first was a two-channel setup with Atlantic Technology IWCB-52 in-wall speakers in my master bedroom. The second was an in-ceiling stereo setup with Beale Street Audio IC8-BB speakers located in my kitchen. The third was a 2.1-channel setup with two Atlantic Technology IWCB-52 in-wall speakers and a JBL passive in-wall subwoofer. Because the Paradigm PW Amp won’t drive a passive subwoofer and provides only line-level subwoofer output, I connected the Paradigm subwoofer output to a Lexicon 125wpc power amplifier and used the Lexicon to power the JBL sub. 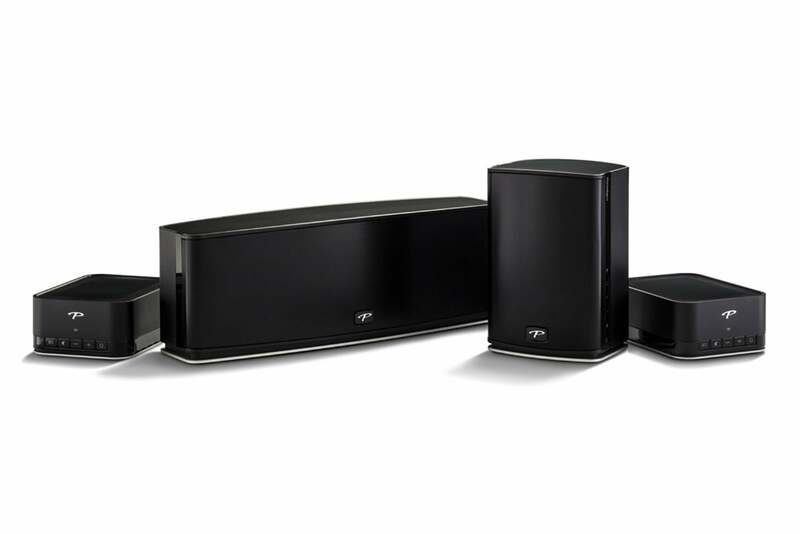 I tested these three installations because of their sub-optimal placement and sound in my home. I’ve never been able to use room correction on them. 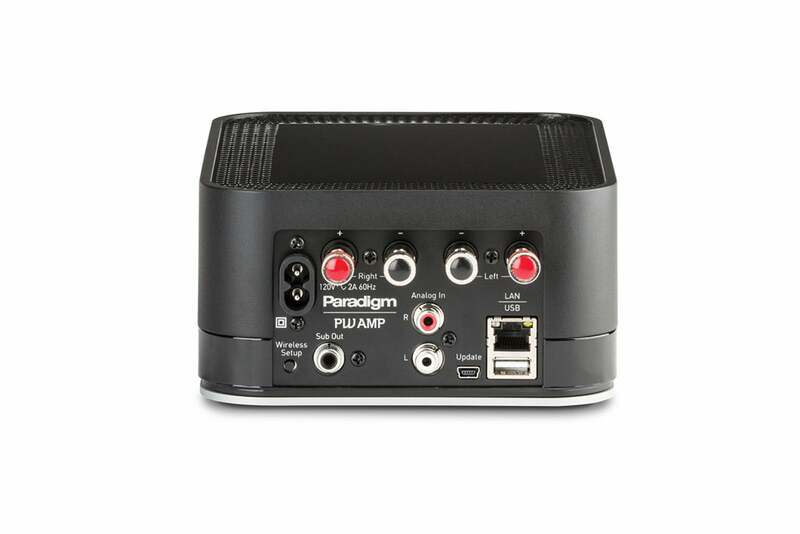 Paradigm’s PW Amp can stream high-res audio while correcting your speakers’ and room’s acoustic shortcomings.